Note that as discussed in the comments under this post, Michael Schmidt has recently been criticised for defending 'national anarchism' (which similar to 'national bolshevism' attempts to reconcile anarchism with racist and xenophobic politics in order to reconcile with working class fascists). libcom.org is absolutely opposed to 'national anarchism' or any attempt to defend it. This book does not discuss 'national anarchism' but as also noted in the comments, the sections on race and gender and the particular ways it treats (for example) Connolly positively and Marxists negatively should be read critically with this in mind. Err... didn't the author take issue with this being added to the library in the past? Yeah, I thought he threatened a lawsuit, in typical anarchist camaraderie and solidarity. no, this is completely untrue. One of the authors did politely ask us to take it down initially, which we did, as they were trying to raise money for its translation. This translation is now underway as I understand it and the author has given us permission to put it back online, for which we are very grateful. Does anyone know what the deal is with the sequel? Is it ever gonna be published?! The parts on Race and Gender are pretty dumb. The BF stuff on these is mainly a description of historical anarchists and syndicalist positions e.g. of the Wobs: those are dumb, how? Curious. I credit this book with making me a better anarchist. It was probably the first anarchist theory book I read just after I realized anarchism existed and embraced it as an alternative to my former (reluctant) semi-Leninism. It was an excellent education, and despite some disagreements, I think it's a good book to read whether or not you're new to anarchism. I woud like to like it more than I do. The authors ideological anti-marxism makes the history inaccurate. It needn't be pro-marxist just more accurate towards the marxism in syndicalism. Turns out Michael Schmidt, one of the authors of this book is a White Nationalist, which is inimical to communism and anarchy, as Libcom would understand the terms, no? I suppose the emerging Shmidt revelations may cast a different light on the book's ridiculous attempted inclusion of nationalists like James Connelly as anarchists (as well as the pro-bolshevik Bill Haywood and parliamentarist De Leon). A disclaimer AND a trigger warning! FWIW, I think the book should should remain in the library. Remember, there are two author's here, one who may have taken a righwing turn, the other has not. I mean, we have stuff in the library written by folks who have taken rightward positions (Kropotkin-the war, the FAIistas-government) and so forth. Perhaps a straight forward and non-snarky Collective intro comment would be useful. But I'm not for censoring this book, all my political, historical identifiers and personal feelings aside. "My full, illustrated 51-page refutation of AK Press' defamation against me is now published online on my blog, Drinking With Ghosts, as "Michael Schmidt: An African Anarchist Biography". I am hoping people will actually read the Schmidt reply. Its long but raises very serious questions about the Reid-Ross and Stephens articles. I think it also raises serious questions for all of us about a movement culture that leads so quickly to people jumping on the bandwagon of denouncement without having all the facts. Yes, this needs to be noted. Also, l think it would be useful to compile all the Lucien sock-puppet comments in one place to lend clarity to what has been the history of the debate. For what it's worth, l still think that few people have really touched on the real issue of this whole story, which is not how one guy goes bad, or lies to his comrades and the world, but how it is possible to smuggle in reactionary, right-wing, nationalist ideas into the movement. 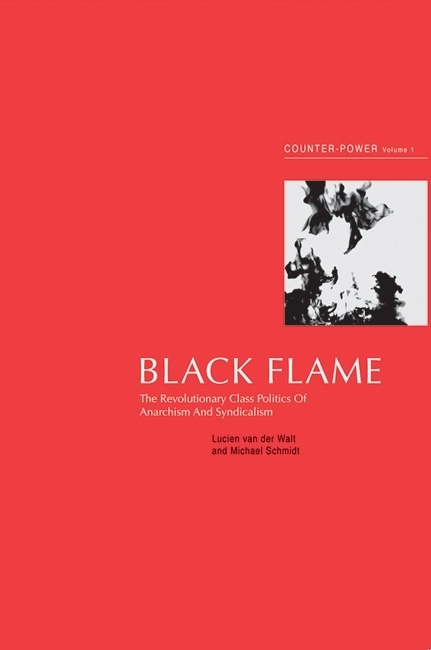 Black Flame needs to be analyzed in this respect, because there are many signs there that these ideas have infiltrated the thought of some anarchists, perhaps in forms which others apparently do not recognize. it could be done online if people are willing; with or without author permission [though the latter could result in threats, legal or otherwise, which both authors are known for]. l wouldn't worry about threats. lf there is a public record of the sock-puppet comments, l would just compile them. They are now, unfortunately, part of history. Can we have the Black Flame PDF kindly removed from the libcom library? There are enough copies floating around the web and it would make a statement that Libcom doesn't support the fascist author, or the antics of the co-author on Libcom forums. Why would it make a stronger statement than a note at the top explaining his background, that they don't support him and to read critically if at all (which other versions don't bother with)? It'll have warned far more casual searchers about his politics than otherwise, and it's not like they're paying him a retainer for it. Sometimes I don't think people understand how the internet actually works. You got me pegged, I don't understand the Internet. I would welcome such a statement but no one wants to take ownership of it and it may be much more controversial, never actually get done, and so on. Also, since I don't understand the Internet, can you explain to me how many users are likely to use this thing called Google and just get a direct link to the PDF of the book? Help me out - am I Googling correctly? Not even one page of that can be modified or added without the authors and publisher's permission, and that's a tangled web indeed. People stumbling across this page looking for the book are unlikely to read anything else on this page and will just click the link, perhaps in less than 2-3 seconds. We're trained to do that by all the visual clutter in our browsers. The note at the top could perhaps be titled as a 'WARNING' and highlighted in bold typeface but that is just a technicality - I'm not to keen on the more recent attempts to push the admins to remove texts and links to material because of subsequent criticisms of the authors that may not be apparent from the material posted. Why that treatment rather than what was done with the Chris Harman book-- simply removing it because of the author's association with the SWP?